(pp. 17 - 20): From "Les grottes de Lindenthal ou le château de Thorberg"
(pp. 167 - 178) From "Le château des Clées et la superstition"
(pp. 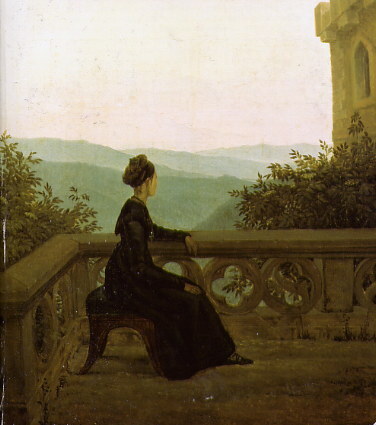 203 - 239): From "Le château de Weissenbourg"
This picture was also chosen as cover illustration for the 1998 reprint of the Oxford Classics edition of Ann Radcliffe's The Mysteries of Udolpho. When Carus's painting is placed against Cassandra Austen's drawing of Jane Austen (often misinterpreted as simply coming out of a perverse refusal to show Jane Austen's face), we see Cassandra's drawing would have been understood as one of a woman absorbed in imaginative reverie. 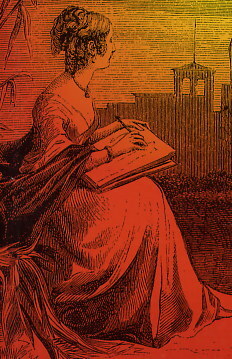 Compare also the illustration to the Italian version of The Romance of the Forest (Gli Assissini de Ercolano, 1871), chosen as cover illustration for Rictor Norton's biography of Ann Radcliffe, Mistress of Udolpho. Isabelle de Montolieu's texts mediate between those of Ann Radcliffe and Jane Austen. All three pictures are appropriate to the self-conception and relation of author to text for all three women.